Major motion picture history is continually evolving, even more so than merely growing. Not only are new films being constantly added, but older ones gain recognition and overdue respect - with greater perspective that is afforded by the passage of time, the growing reputation of its stars and directors, as well as the ever-expanding home viewing market. This suggested list of the Third 100 Greatest Films (though technically 102 due to two ties) provides a more comprehensive collection, many of which could easily be interchanged with the original lists: the 100 Greatest Films or Another 100 Greatest Films. These films were chosen using the same Selection Criteria that was employed for the previous 200 selections. The views of distinguished critics, other polls, awards recognitions, and other criteria have been considered to produce this compilation. Arguably, there is reasonable consensus by most film historians, critics and reviewers that these selections are among cinema's most critically-acclaimed, significant "must-see" films (of predominantly Hollywood-American production). 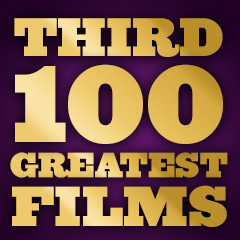 A compiled, chronological listing of all film choices is indexed at 300 Greatest Films. As before, these choices were limited to English-language, theatrically-distributed, narrative feature films. That means foreign-language films, documentaries, TV movies and mini-series, and short films were not considered. Emphasis in these selections is purposely directed toward earlier, more classic Hollywood/American films (and other English-language films) than more recent films, although some recent films (and British films) are included. All of these choices are influential films with a singular vision - they provide a diverse palette of movie memories and experiences. Making the choices more difficult than before was that there were no truly obvious choices -- no Citizen Kanes, no All About Eves, no Casablancas. Granted, many of the films were earlier candidates that just missed selection in the top 200, such as Marty (1955) or Being There (1979). Others were the second tier of films of noted directors, such as Alfred Hitchcock's The Birds (1963) and Frank Capra's Arsenic and Old Lace (1944), or Charlie Chaplin's The Kid (1921) and The Great Dictator (1940). Some are under-appreciated recent classics whose inclusion might be surprising, like Groundhog Day (1993) and A Fish Called Wanda (1988), while others are pioneering films, like A Hard Day's Night (1963) and Koyaanisqatsi (1983). Some are just indelibly imprinted in the moviegoing public's memory, like Rocky (1976) and Spartacus (1960), while others are small-yet-important independent film efforts like Blow-Up (1966) and Night of the Living Dead (1968). Some are merely quiet, classic films that are often unfairly forgotten when the subject of "the best films ever made" arises, like Amadeus (1984) and Crimes and Misdemeanors (1989), while others are major, epic Academy Award-winning films like Titanic (1997) and The Last Emperor (1987). Hopefully, for now, this list will inspire debate over inclusions and exclusions, which is always the aim of any list -- to renew interest and passion in cinema. The lists (and links to reviews) provide your own private film studies course or a crash course in cinema literacy. Comparative analysis and criticism provide the rationale for having many Other Greatest Film Lists available for viewing on this site, such as AFI's 100 Greatest American Films.